I hated seeing Derek lying on the floor with his eyes burnt out, his horrified girlfriend screaming. I think I might have been muttering No No No Jack No No No, much to my family’s dismay. And who does Jack see as he hitches a ride with the Dreamwalker? Mary, now in the hanging cage that Lucifer was being tortured in. That didn’t help my poor stomach at all. There’s more to like about Jack in this episode, but let me more or less follow the episode’s progression because there was a lot happening! While Jack is out hitching a ride with a dreamwalker, Dean and Sam are desperate to find Jack. So desperate that Dean is doing something that felt a bit off to me – calling Patience (Clark Backo). After he told her to stay out of the life and stick to normal if she possibly could, he’s calling her to ask for her help in finding Jack. Yes, he acknowledges the change of heart and the reason, but it still didn’t feel quite right to me. Especially when we see that he’s called her six times! That’s called stalking, Dean. It all feels a little more worrisome when this is a high school student we’re talking about. So not one of my favorite things. Patience, for her part, is having a tough time of it even apart from Dean Winchester being intrusive. She’s lying to her dad (which he somehow doesn’t realize even though it seems fairly obvious to me) about having visions, and her grades are suffering for it. If you can call getting a C suffering, that is. 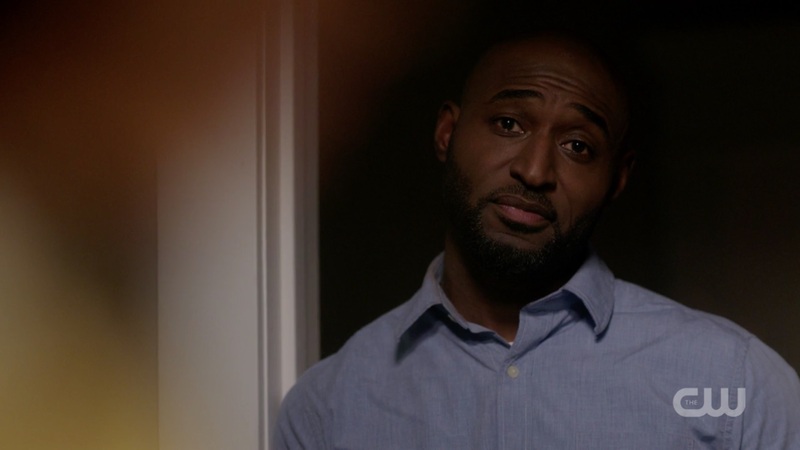 I work with clients all the time whose perfectionism is definitely not doing them any favors, so I really bristled when Patience’s dad (well played by Adrian Holmes) told her in no uncertain terms that only perfect grades and SATS were acceptable. Bad parenting, Patience’s dad! The dads on Supernatural make some really crappy decisions, and this dad takes a page out of the John Winchester parenting handbook by telling Patience that if she leaves and “chooses that life”, she can’t come back. WHAT? I mean, I knew he made bad decisions after the whole decade of lying to Patience about her grandmother Missouri, but this was almost worse. Who sets those kinds of limits on your kid when it’s clear they’re trying to do something GOOD?? Poor Patience. Good thing she kept Jody’s business card. 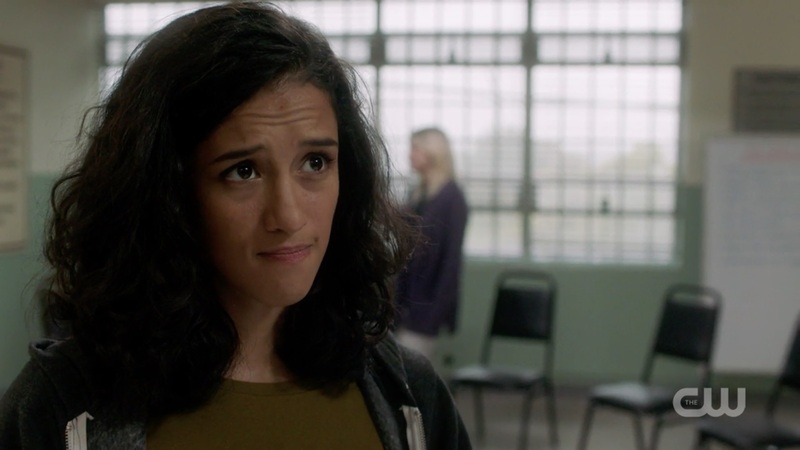 The threads coming together for Wayward Sisters is one of the most exciting parts of this episode, so while my heart hurt for Patience (Backo does a good job showing us her struggle), I also was like oooooh she’s goin’ to Jody, she’s goin’ to Jody! Speaking of Jody, she calls Sam and Dean with a lead on Jack. This gives the boys a chance to pull out their dad’s journal, which I have a big nostalgic soft spot for, so I was happy. 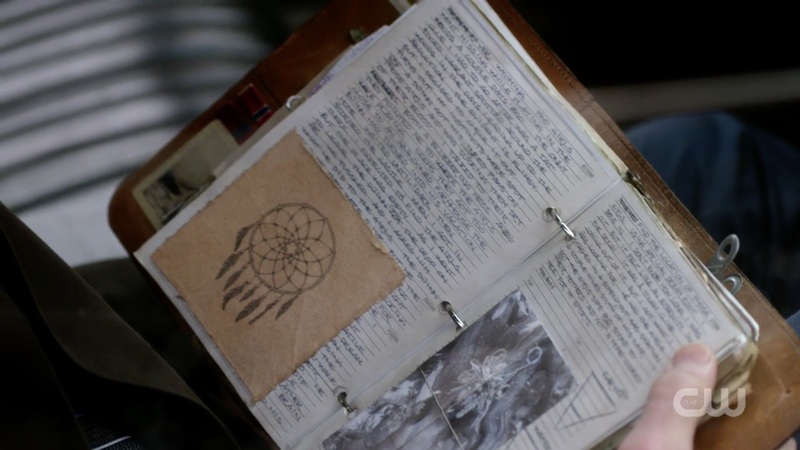 There’s something about Sam leaning over the journal, reading out loud to Dean about Dreamwalkers, that calls back to the early seasons and brings a sense of continuity to us now, thirteen seasons later. There’s research out there that shows that it’s our familiarity with our favorite shows that brings the most psychological and emotional benefit, so every time something like that happens, that nice warm feeling just sweeps over me. Ahhh. Anyway, research done, the boys head to Derek’s studio to talk with the traumatized girlfriend. There they learn he was a Dreamwalker and see the painting that lets them know he’s been to the AU – Apocalypse World as we’re now calling it. 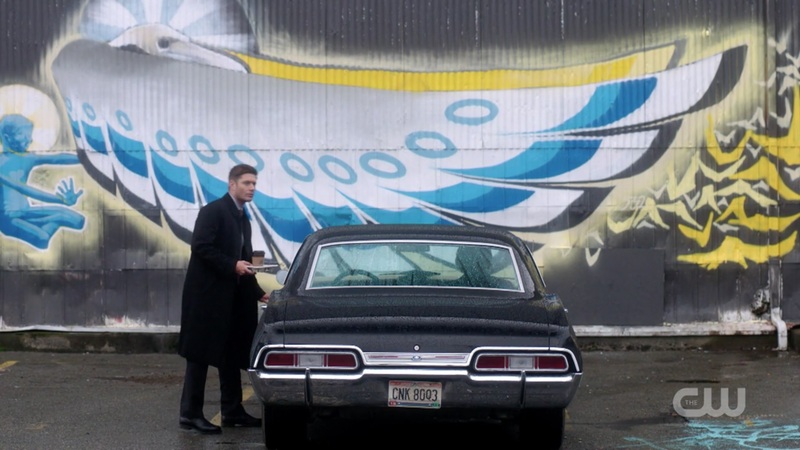 Sam and Dean get in the car, in front of a big beautiful blue winged mural on the side of the studio so kudos to Jerry Wanek and his team of wizards. Dean knows this is Season 13 so he keeps to the new norms, thankfully. Dean to Sam: We gonna talk about it? Of course they are, because this is Season 13! Dean: Looks like Jack gave up on us and is looking for his daddy. Me: (and Sam probably) NOOOOOOOOOOOOOOOO!!! Dean: This isn’t an I told you so. I actually like the kid. I liked that little conversation so much, because it’s the Winchesters really being open with each other. 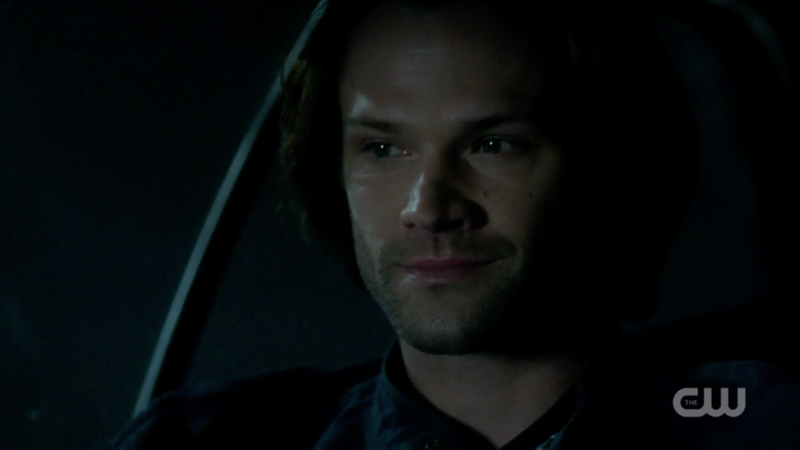 Before Sam can misinterpret, Dean lets him know how he’s actually feeling and that this is not what he wanted either. Season 13! Also, thank you Serge Ladouceur, for those gorgeous close ups. You never let us down. Another thing I really liked? Kaia Nieves (Yadira Guevera-Prip). We first meet her in a group therapy session (with a not so great therapist, which always makes me feel a little defensive for my profession, but whatever). Kaia is revealed to us little by little, covered up all over and hiding under a hood and under her well honed snarky defenses. Her portrayal was so realistic that I found myself thoroughly believing her as a reluctant, defended client – both the acting and the writing were spot on. Even her little quip about Trump rang so true (I guess on the show we’ve intersected with real life now that the Lucifer-possessed president guy is out of the way). She actually sounds just like an addict in denial, which is how the therapist treats her, but when Kaia says she doesn’t want to go to “the bad place” she means something much more literal. She too is a Dreamwalker, but instead of being able to go where she wants, she always ends up there – and comes back not only psychologically scarred but literally bloodied. Those scars she’s hiding under her sleeves are not from cutting. Jack shows up, and he’s progressed from “I like nougat” to “I like cocaine” alarmingly fast. 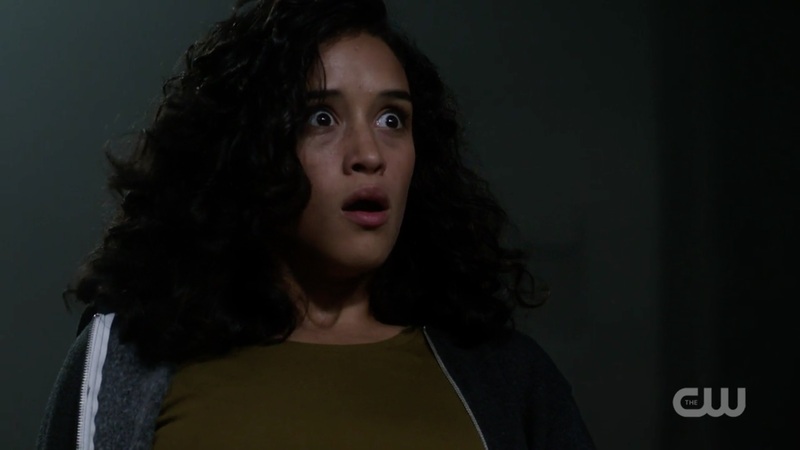 Kudos to Berens for this whole scene, to Calvert for always bringing that hint of oh-wait-he-looks-kinda-sinister-right-now feel to Jack, and to Yadira because Kaia’s reaction was brilliant – Yadira’s facial expressions are amazing in conveying so much, from shock to humor to horror to joy. The little shout out to Kim Rhodes’ previous series was a nice touch, Mr. Berens. I’ll say. I already have a lot of empathy for Kaia, but that seals the deal. Meanwhile, Kaia is proving herself not only relatable but badass. And smart. 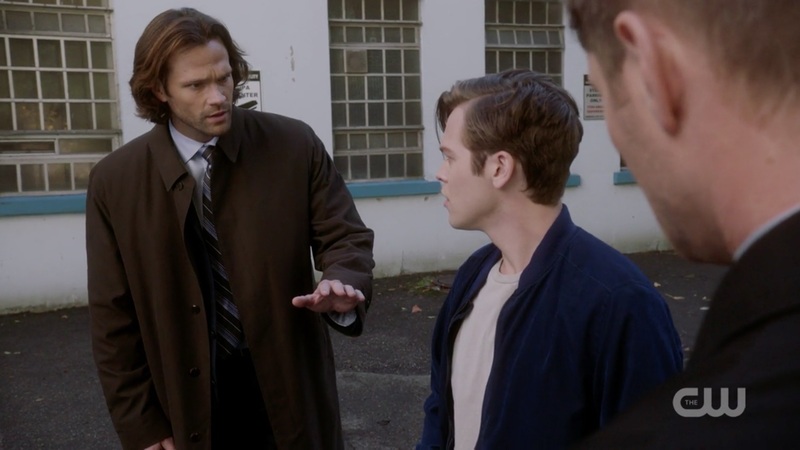 She refuses to go with the creepy stranger who can break through triple locked doors and knock people out by touching them – I mean, odd decision, but… Jack is distracted by Sam and Dean, which gives Kaia a chance to haul off and punch him and run away. Jack: (indignant) She hit me! 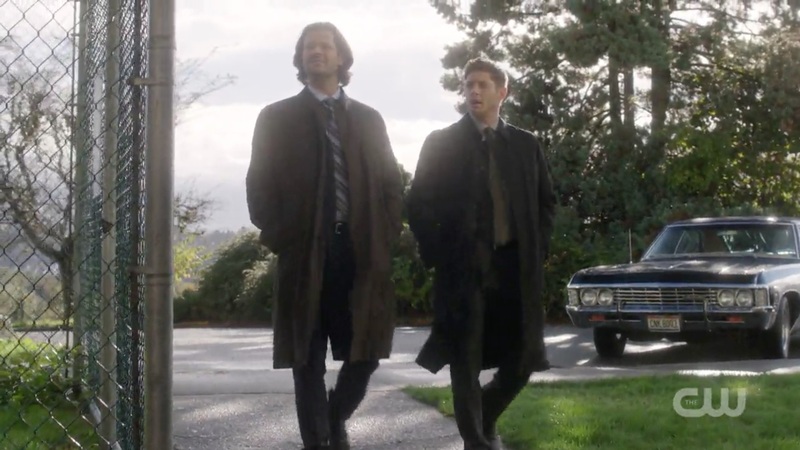 We also got a bit of Winsync as Sam and Dean walk up to the building, which I always appreciate. 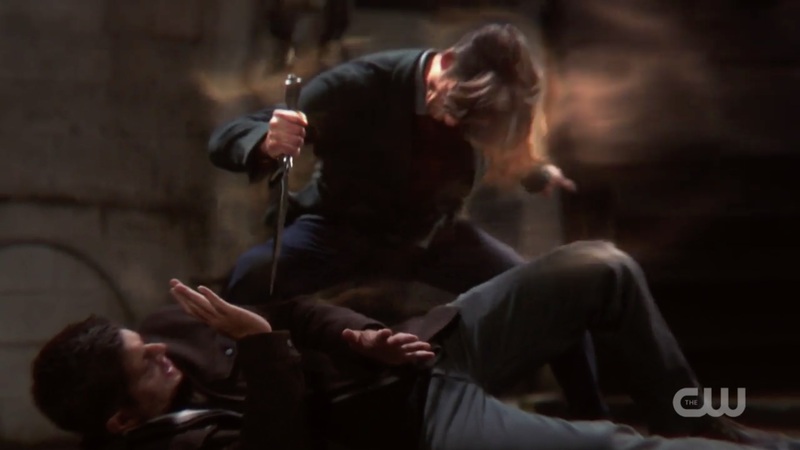 Then we get one of my favorite scenes in the episode, during which Calvert, Padalecki and Ackles all knock it out of the park (with help from Berens and director Phil Sgriccia). Jack: I’m doing this for you! I wanted to prove to you that I’m good. So I did the thing you wanted the most…. I researched, like you taught me… And I saw her. Your mother. She’s alive. Oh Jack, you’re breaking my heart. Again. 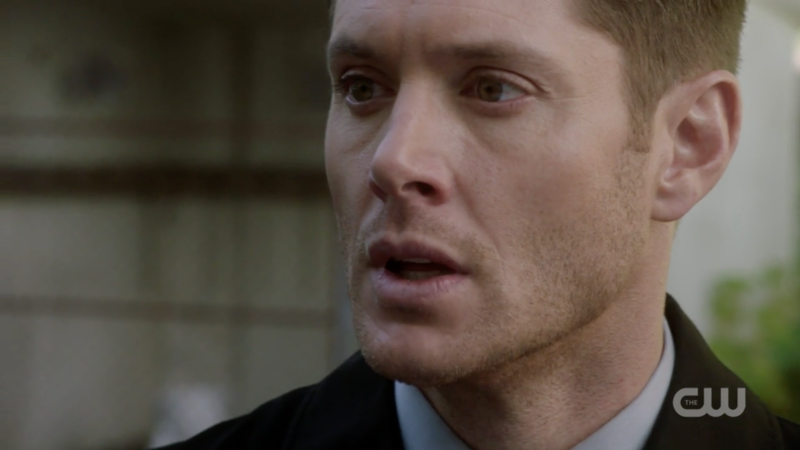 Dean: (absolutely dumbfounded and already overcome with emotion) What? 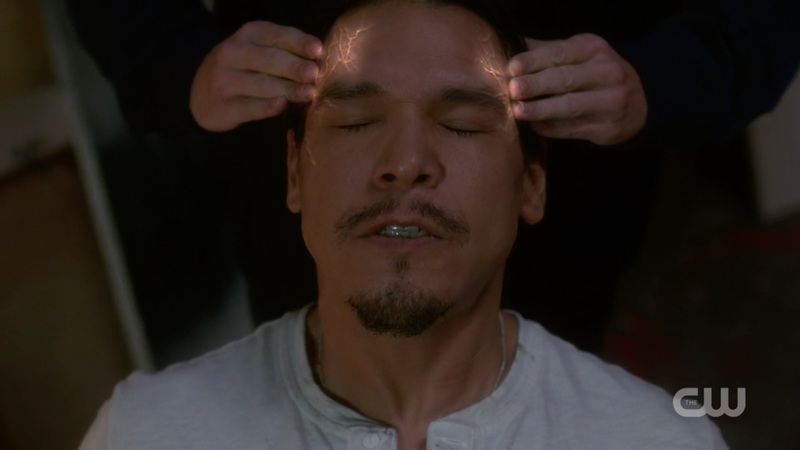 Jack shows them what he saw, and they actually SEE Mary being tortured, and hear her calling out for help. It must KILL them to see and hear that and not be able to do anything. 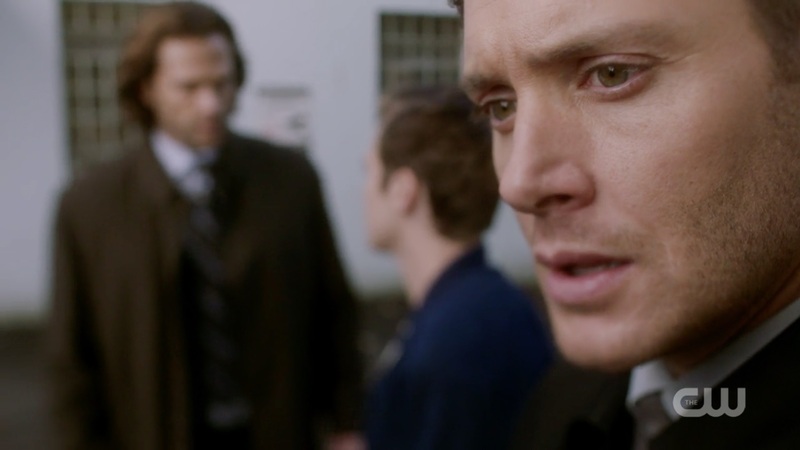 There’s a moment then where we focus on Dean’s face, and everything else that’s going on seems to fade into the background. He turns away slightly from Jack and from Sam, a look of shock on his face at finding out his mother is alive. And then, in just a few seconds, you can see his expression harden, his jaw set. That right there is Dean Winchester swearing to god that he will do whatever it takes to save his mother. It’s Dean channeling John every time he put his boys into danger to try to save Mary. It literally gave me goosebumps. It was brilliantly scripted, brilliantly directed, brilliantly acted. It’s those small moments that are so powerful in this show that make it the extraordinary thing it is. 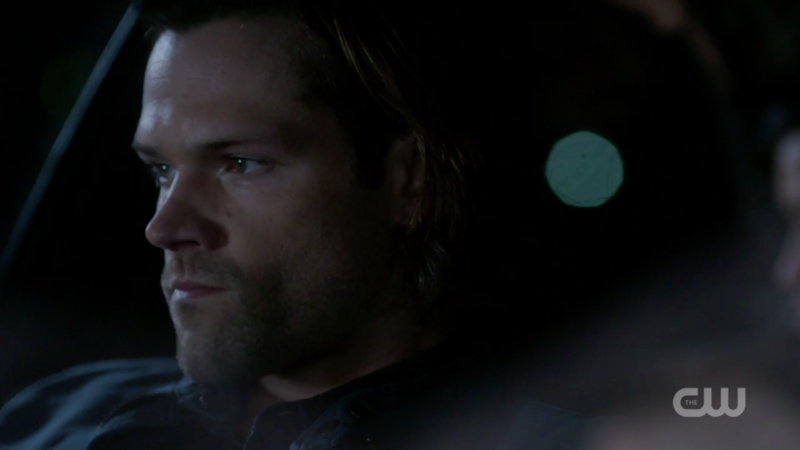 The other incredible scene I LOVED was the “car scene”, with Dean and Sam in the front and Jack in the back as they go after Kaia. Berens shared on twitter that as originally scripted and shot, that scene was much shorter. But the episode actually (miraculously) came in under time, so they had some time left to fill. They “collaborated and spitballed” and realized they could reshoot the scene in an extended version. Berens added that it “felt like a cosmic gift”. And I definitely agree! 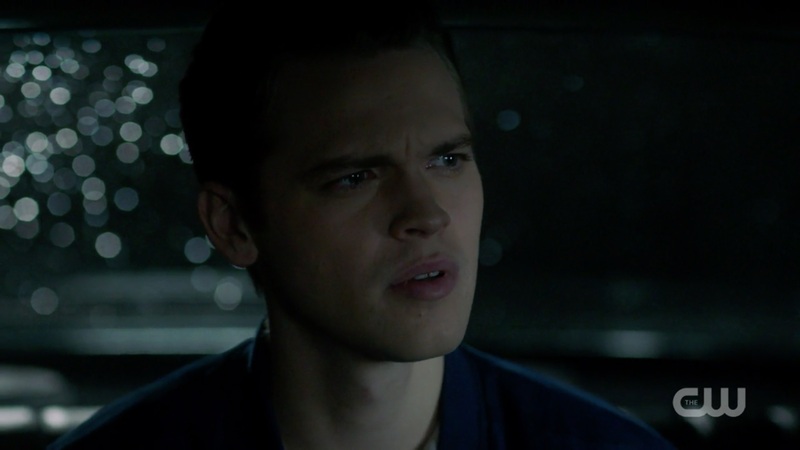 Berens: Strong case to be made it’s the MOST important scene in the ep, the emotional payload, and we almost didn’t have it….ALL that stuff was written as subtext to the episode but it became clear I messed up, we NEEDED to see that moment…. So Phil shot it perfectly, and of course Jared, Jensen and Alex hit it out of the park. So lucky. I’ll say. Also, the Season 13 rules about open communication are still in play, and I am ridiculously grateful for that. Dean to Sam: You were right. This whole time… We should have been looking for her. 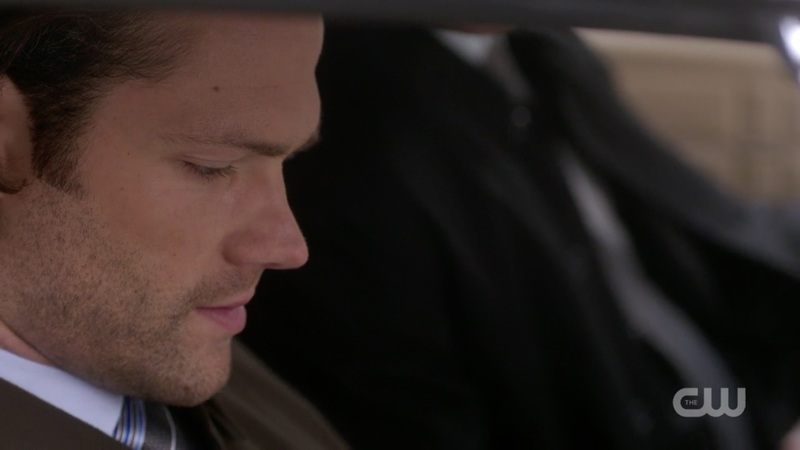 Sam tries to console his brother because he KNOWS how hard Dean will take this, saying he didn’t know, he just hoped. But it’s clear that Dean is taking this on himself, guilty and traumatized because he gave up on his mother. Dean (and me) struggled mightily with Sam giving up on looking for Dean way back in the Amelia season, so this is something that must really hit home for him. And that worries me. Like, a lot. Dean: We find her. No matter what. Then there is the absolutely wonderful conversation that came from reshooting the scene and being able to make it longer. It makes me wonder what kind of glorious moments we would have if our show always had the luxury of time, because this? This was effing magic. I smile every time Dean calls him ‘kid’. Jack is not, in fact, okay. 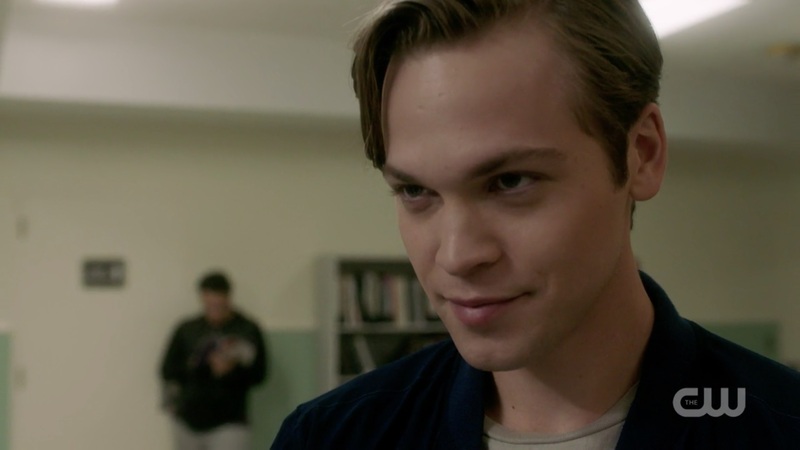 He realizes that the Winchesters believed he was capable of doing something awful like killing Derek. Sam struggles to explain, and Jared does an amazing job making it incredibly real and poignant. You can hear Sam’s voice shake, he even stumbles over his words a little in an attempt to make something awkward understandable. Dean finally admits that they thought he went looking for his father. Jack: Lucifer? He’s no one to me. You – Castiel – you’re my family. Dean: Yes. Yes we are. Dean: Finding mom, you did a good thing, kid. A real good thing. The small smile on Jack’s face made me tear up. And the look on Sam’s face when he hears Dean say that! There are tears in his eyes, and he just looks so…. Relieved? Happy? It made me happy too. 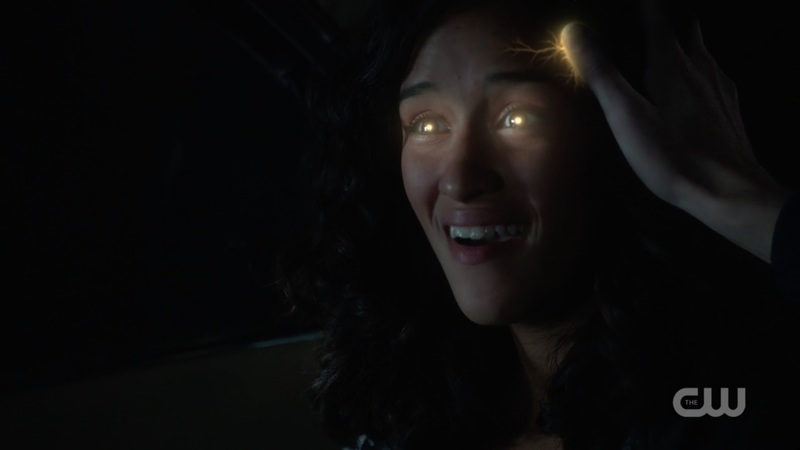 Kaia, in the interim, gets kidnapped by a bunch of angels who are of course dicks because really, angels are the worst on Supernatural. I get that they’re desperate with the whole going extinct thing, but wow, they are really awful other than Cas. I continue to adore Kaia, both the acting and Berens’ writing. The angels tell her they’re using her as bait to lure the Winchesters and Jack, and she scoffs. Kaia: They won’t come for me, you picked the wrong bait. No one’s gonna fight for me. I’m not white, I’m not rich, I’m not blonde. I don’t matter. That line didn’t pull any punches, and it hit many fans very hard. Several people on my timeline posted that there were tears streaming down their faces, they were so shocked and so validated to hear a person of color be that outright on a television show. But Jack and the Winchesters do show up, and the angels try to talk Jack into coming back to Heaven with them, saying he belongs with his own kind. 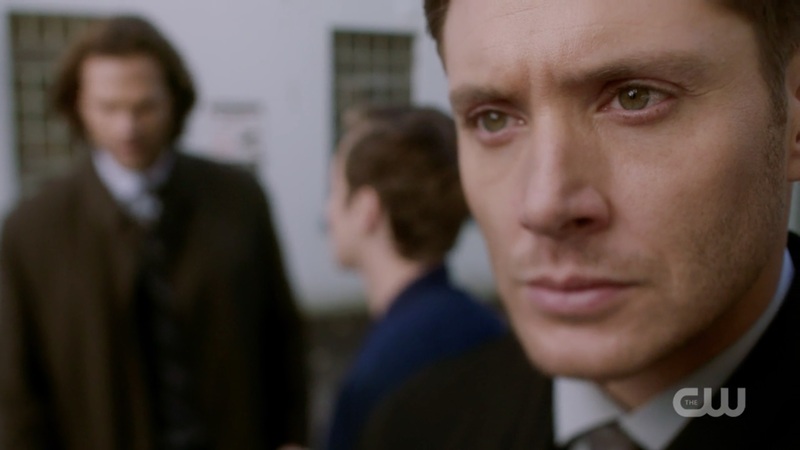 Jack: (glancing at Sam and Dean): I am home. Jack saves the Winchesters’ very fine asses, much to Kaia’s shock, with the amazing VFX that characterized this episode on display too. Then they try to explain to her who they are and what they do. Kaia: And he’s the son of Satan. At some point in here, the actress ad libbed an under her breath “What the f—k”, which was glorious. And which Sgriccia left in, bless him. The next scene is the one that didn’t sit well with me. It’s more than 24 hours later now, and I’ve had time to come to terms with it, but I still am not 100% comfortable with it. Sam pleads with Kaia to help them find their mom, trying to explain what’s needed. He even uses his puppy dog eyes. Jack tries too, telling her “we need you.” Dean listens, then adds his own plea, which goes right to the heart of where Dean Winchester’s head is at right now. Dean: We can save her. And really, when he says that? I should have known. There is nothing that comes before saving his family for Dean Winchester. Nothing. But Kaia says no. She only goes to the bad place when she dreamwalks, and she doesn’t come back unscathed. Again, she says no. 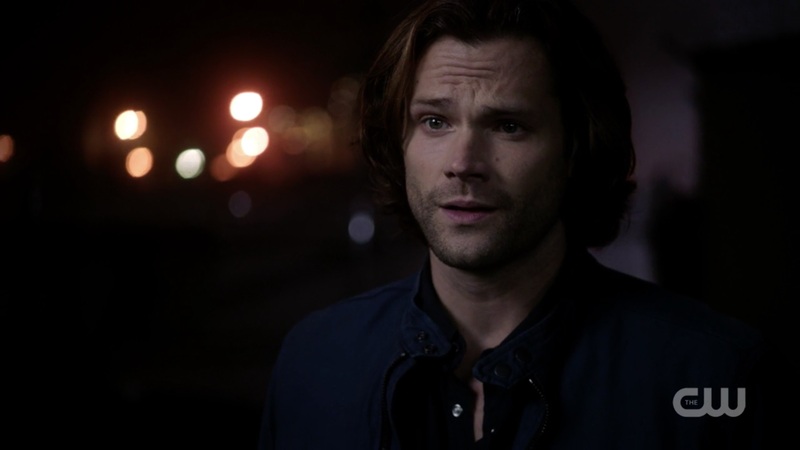 There’s a loaded pause, and Sam reluctantly says what we’ve heard the Winchesters say many times when someone is reluctant to put their lives on the line. Dean interrupts him, pulling his gun and quietly cocking it. Sam looks shocked, and in my living room, I am literally gaping. WHAT ARE YOU DOING, DEAN?? I even had a brief moment of wait, is that Dean? Did he somehow get possessed? 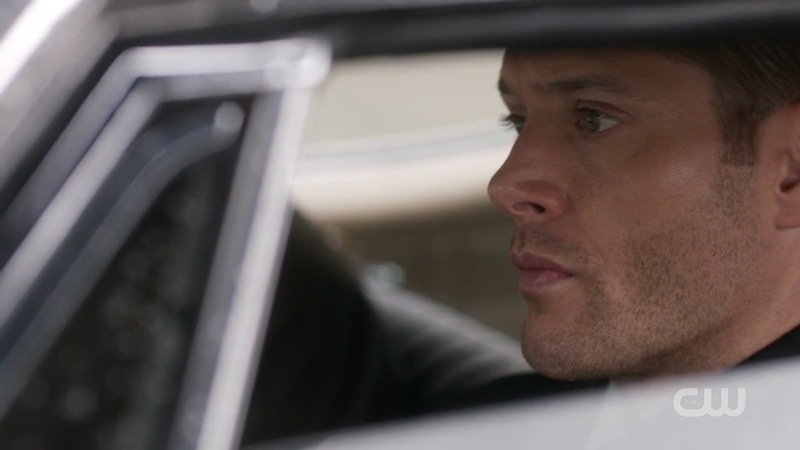 Dean: (in a tone of voice that sent shivers down my spine) Get in the car. 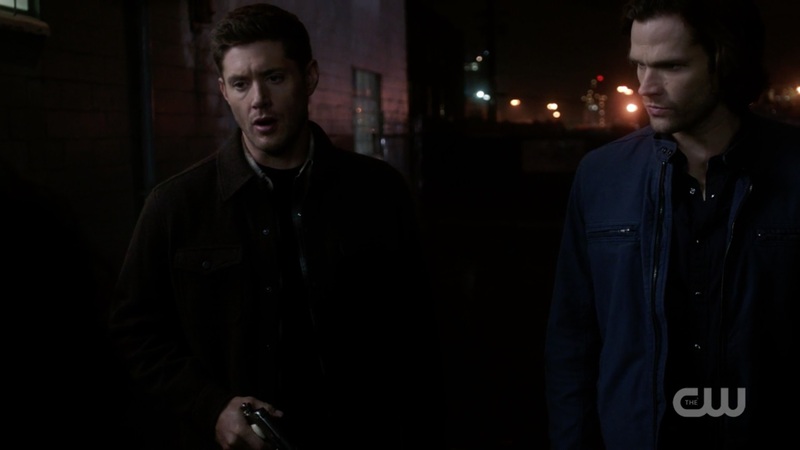 And then the most shocking thing happens – Dean suddenly LOSES IT, brandishing his gun and yelling GET IN THE DAMN CAR! 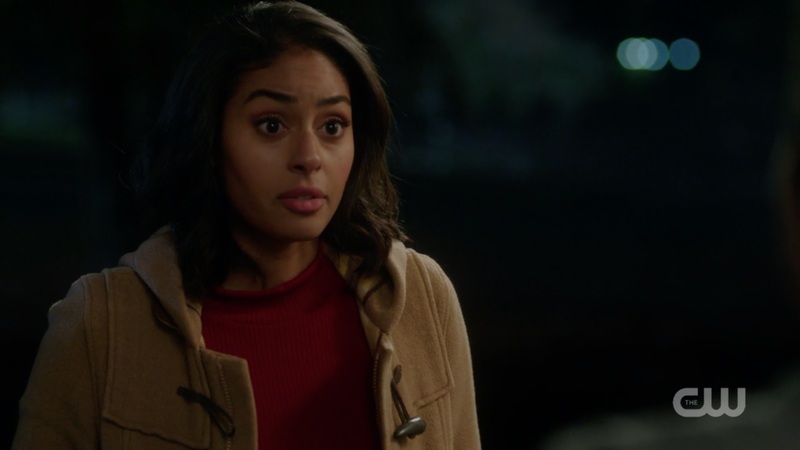 Kaia looks as frightened as me, and she gets in the car – I mean, who WOULDN’T get in the car with Dean Winchester yelling at you like that? My timeline immediately split into “I’m terrified” and “Uh that was weirdly hot” while I felt just like Sam looked – just plain shocked. Dean: (with steely determination) We’re going to South Dakota. I think I understand what they’re going for here, but I still experienced this as shocking. This is Dean’s mother, his family. Who is being tortured RIGHT NOW and is screaming for him to help her, her screams echoing his own when he was alone and in agony in Hell. He can no more leave her to that than he could leave Sam – he will move heaven and earth to save his family. I know that, I love that about the character. But this just felt a bridge too far for me. Kaia is a teenager (I’m assuming) and a vulnerable one at that. She clearly said no and he ignored it and forced her into the car – he essentially kidnapped her just like the angel dicks did. Not for as nefarious ends, sure, but whoa. I had a hard time reconciling that Dean with the Dean I know and love. It’s not that I expect the character to be perfect. He isn’t, I don’t want him to be. He’s complex and flawed and imperfect and sometimes he effs up in a big way. I know Dean has been in a bad place himself this season, and I know how prone he is to throw mountains of guilt on himself – and that makes people do pretty crazy things. I can’t imagine anything causing more guilt than not looking for his mother while she’s being tortured and in agony and crying out for help. Dean could rationalize it with it’s for the ultimate good and he’ll be sure she’s safe, but it becomes clear pretty quickly (and really he knows) that he can’t do that. And we just heard all about her tragic life so far and how awful it is for her to go to the bad place, so forcing her there is just hard to swallow. Maybe it’s the therapist in me, but I was entirely on Kaia’s side in that scene, not Dean’s. With a day and a half of perspective, I’m guessing it wasn’t about rationalization at all. It wasn’t about anything even close to rational. It was Dean Winchester at his most vulnerable, his most unhinged, overcome with guilt and able to see and DO only one thing: save his mother. It just didn’t feel good, but maybe that’s the point. Dean: We get Mom back no matter what, remember? Pretty sure neither Sam nor I defined it in quite this way, Dean. That scene still doesn’t sit entirely right with me. It’s hard to believe Dean would go that far, even if I understand that he’s not exactly in his right mind psychologically. It was still very hard to watch. Jack takes over as the voice of reason (which is really saying something, Dean! ), apologizing to Kaia and reassuring her that not everything she sees in dreamwalking has to be the bad place. Jack: Our powers can be good. We can do good in the world. He shows her some of that good, and that seems to persuade Kaia more than Dean waving his gun at her (go figure…). But at that moment the angel dicks cut them off and they take refuge in a boat yard. In a big giant abandoned boat. Like, a real boat. Not a VFX boat or a set, but a real boat. Whoa. That scene was amazing, with all the kudos once again to the crew who makes this show look like a motion picture day in and day out. Dean seems to come back to his senses, apologizing to Kaia for dragging (literally) her into this. 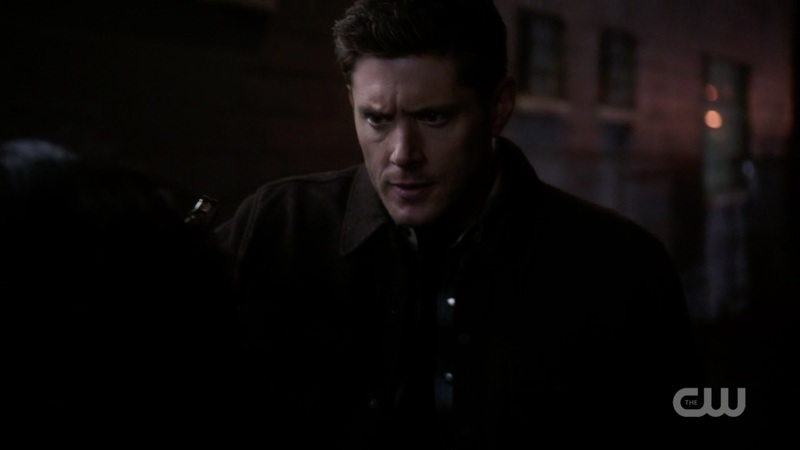 Dean: Sorry to drag you into this, it’s not your fight. But Jack has gotten through to Kaia and she’s on board – or maybe it’s just that her well-honed survival instincts have kicked in. Dean: (stating the very obvious) Something already is going wrong! Kaia agrees to dreamwalk and take Jack along, trying to get them all to Mary. Meanwhile, the angels are performing a synchronized sigil-busting ritual we’ve never seen before (canon problem perhaps, or maybe new canon?) The suspense keeps building as they take down one sigil after another, until only one is keeping them out – and it’s slowly melting. By this time, I was about to have a heart attack. Just in the nick of time, Kaia gets to where Mary is and then screams. Her scream, surprisingly, destroys the angels, and blasts Jack and the Winchesters to different places. Kaia wakes up still in our world, Jack at Mary Winchester’s feet. 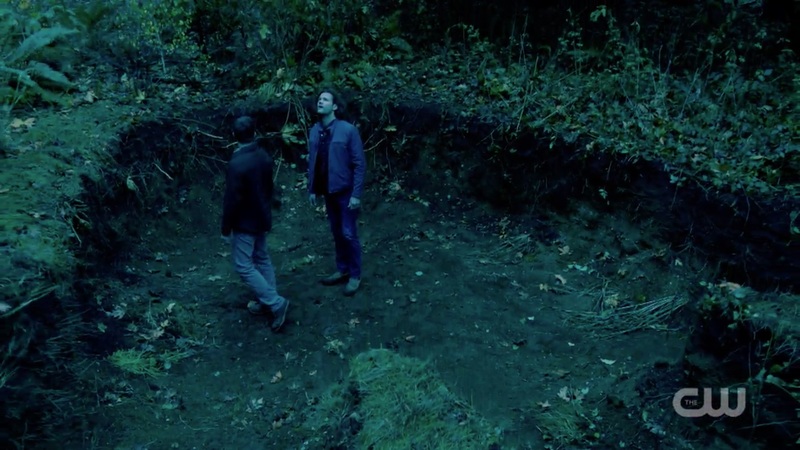 Sam and Dean wake up in the Vancouver woods, except it’s clearly not. Everything is in desaturated shades of blue, so we know we’re not in Kansas anymore. The portal stays open, which can’t be a good thing. In another part of the country, Patience arrives at Jody’s house. Patience: Something bad is coming…. Meanwhile, Dean comes to and immediately pats Sam on the back, which reassures me that yes, this is the Dean Winchester I know and love. Sam: (knowing what Dean needs to hear) I’m okay, I’m okay. Dean has come through with an angel blade, so that’s good. But that’s clearly the only thing that’s good. Standing inside a giant three-toed footprint. I admit I laughed for a second, because for once I was NOT spoiled. But it was a really cool shot and I mean, why the hell not? 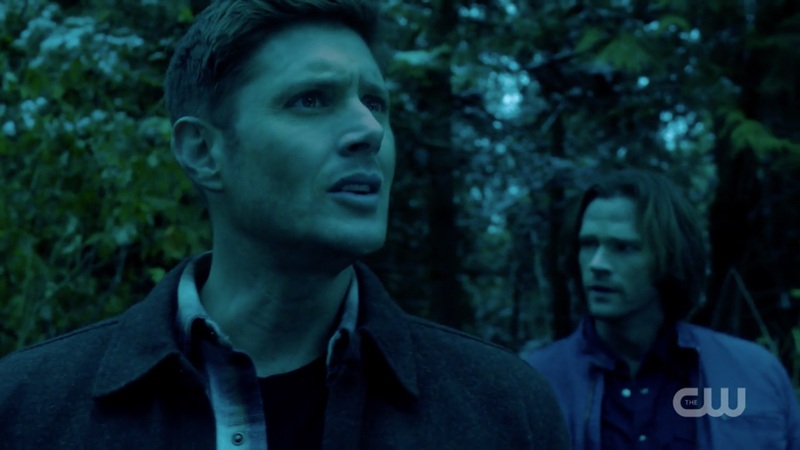 Supernatural has done just about everything else, and it’s Season 13, and we have Alternate Universes to play in – and besides, it’s Sam and Dean against the world and that is never not going to make me happy. My timeline lit up with Jurassic Park gifs – timed just as the trailer for the new Jurassic Park movie hit, believe it or not – and lots of bad jokes about Winchesters and dinosaurs. In fact, it was hilariously split between OMG AWESOME and OHNOYOUDIDN’T! But I think ultimately I’m sorta okay with it. Supernatural has jumped the dinosaur? We’ll see. For now, I just want it to be January 18. And not just because that’s my birthday. It’s also the night that the actual Wayward Sisters episode premieres, which I’m taking as some kind of meant to be thing. Kismet! Caps by @kayb625 – thank you! being on Supernatural has changed their lives! It was a very full episode so I’m going have to go back and watch it a few more times (major hardship I know) to get everything that was happening. Really not sure how I feel about dinosaurs but if anyone can make me believe this, it’s the Supernatural writers. The scene in the car (as mentioned) was fantastic, I like Jack a lot so I’m probably going to end up angry or disappointed. Great cliff hanger as usual. Now the wait begins. On a totally different note, Jack says in The Big Empty, “and I know I should feel bad, and I say I feel bad, but most of the time, I…mostly, I don’t feel anything.” So I’m thinking that Jack has no soul. Angels don’t have souls so maybe Jack is missing his. Any thoughts? I’m worried that very sentence you quoted, where Jack said he doesn’t feel anything, does not bode well for the character I’ve grown so fond of. Hmmm. The soul thing, you may be right…tho he is part human. I’m gonna worry until the show returns! It did totally feel like a movie! So much action and VFX and some epic beautifully shot scenes! I am so glad to hear about the change with the car scene, because so much was added by that conversation. 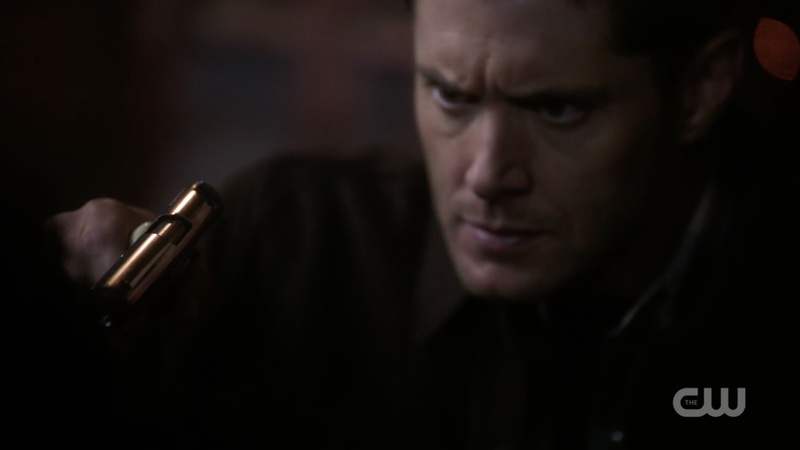 As for the scene where Dean pulled the gun on Kaia…yea, he scared that crap out of me too!! I am glad you were able to get a bit of different perspective after a day, because while it came off as out of character…looking at the bigger picture I can see why he reacted that way. He is still fragile and recovering from feeling powerless to save Mary and Cas (end of last season), they get Cas back, which has lifted him out of the blackness he was in, but Cas is not with them right now. 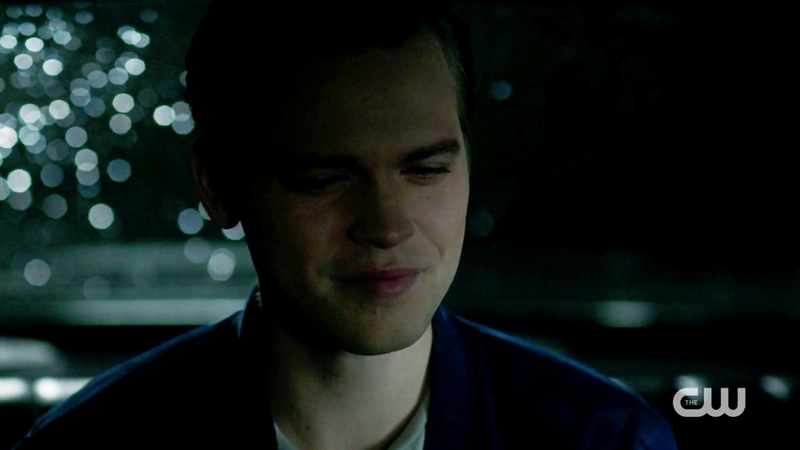 At the beginning of the episode he asked Sam if he’s heard from him – because he starts getting antsy when his angel is not with him. So he’s already on edge and then when Jack reveals that Mary is alive – I think he was totally blindsided (kudos to the visual and auditory effects of this). So now he moves into the “I have to save her, I have to fix this, I’ve let her down” part of Dean’s psyche. Jack tells them that he can almost get to her – Dean isn’t going to let anything (or anyone) get in the way of getting her back. So as you said, I think he really just snapped. I don’t believe he would have followed through on the threat, but he does know how to intimidate to get his way. (Reminded me that they can both be scary badass dudes at times). 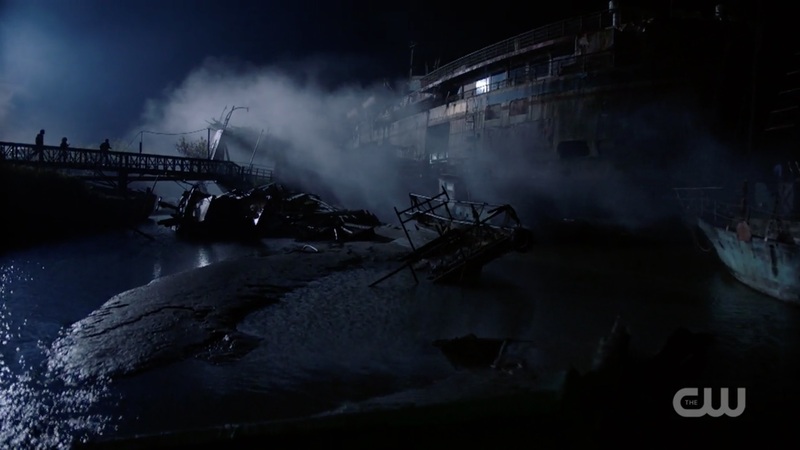 The overhead shot of Dean running into the ship was awesome! The angels’ breaking thru the sigils was awesome! And now, oh crap, they are scattered in different worlds…Kaia is alone and vulnerable (presumably until Jody finds her), the boys are in dino purgatory, at least Jack made it to Mary, but that is also where Michael is. And we have to wait 42 days!!! Oy vey! As beautiful as the scene was of the angels breaking down the sigils, part of me was wondering what happened to the angel banishing spell? (And a part of me was giggling over Angel Stomp, the musical.) 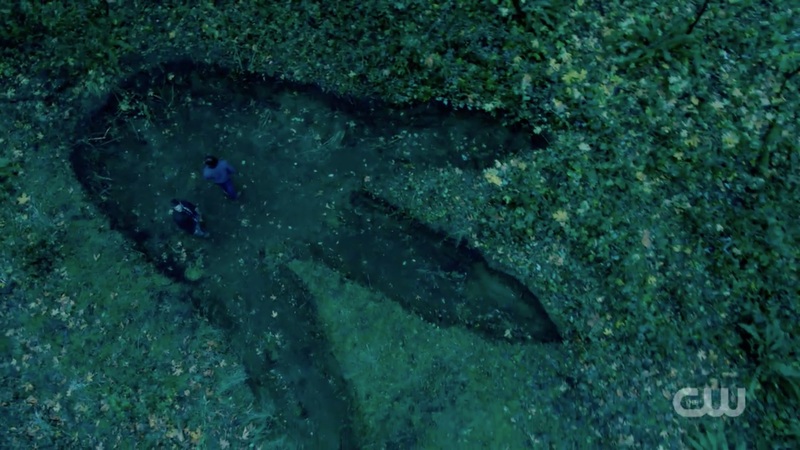 It was beautifully directed, but seemed…strange, which is not something I expect from Bobo. I loved, loved, loved all the scenes with Jack and the boys. Pass the tissues this way! I am not happy with Dean doing what he did with Kaia, but I get it. I get Sam letting it happen less, but I get it. Yadira knocked it out of the park. Glad we get to keep her! Personally, I’m hoping dragon more than dinosaur. We know there’s a person there, so it’s not an accurate historical match to our timeline. Either way, we’re in for a fun ride! I would be totally down with dragons, absolutely! And yes, that angel thing seemed not exactly canon compliant. Sam does suggest angel banishing spell I think, but for some reason Dean thinks it won’t work. A bit of a handwave perhaps, which doesn’t thrill me, but I loved so much of the rest of it. 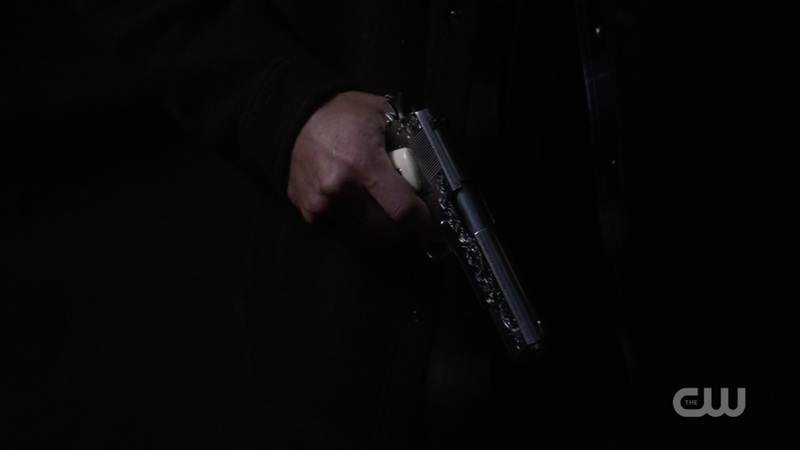 I had a lot of trouble with Dean pulling the gun on Kaia, and still do. After discussing it and essaying about it, I think my biggest problem with it wasn’t that it was OOC — it isn’t exactly, though it’s crossing a line Dean has never actually crossed before for any of his family. 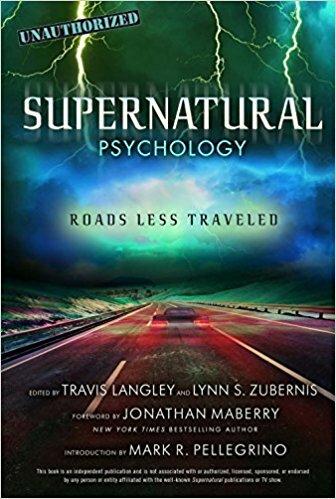 Kaia had just shown them how dangerous her dreamwalking was; Dean was intending to force her to do something that could hurt or kill her. He was in effect trying to trade Mary’s life for hers. And while the boys have done that by accident before (all the way back in s1’s “Faith”), they’ve never *deliberately* sacrificed an innocent person for a loved one. Dean didn’t actually get a chance to go through with making Kaia do it, so maybe in the end he wouldn’t have…but maybe he would have? And that is my big problem with it. Not that Dean did it, but that we don’t see the result of his decision played out; it’s not explored beyond that moment. Dean doesn’t seem guilty about it, and he doesn’t pay for it in any way. 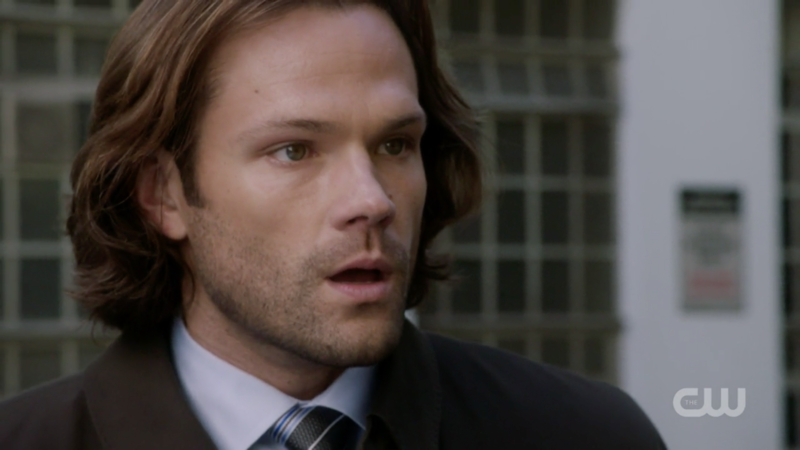 And Sam shocked me almost as much as Dean at that moment, in that he didn’t try to stop Dean or defend Kaia. It almost felt like Sam didn’t think Dean was acting that crazy — like it was normal for Dean to threaten an innocent girl. But it’s not; that’s not who Dean is, not under almost any other circumstances. 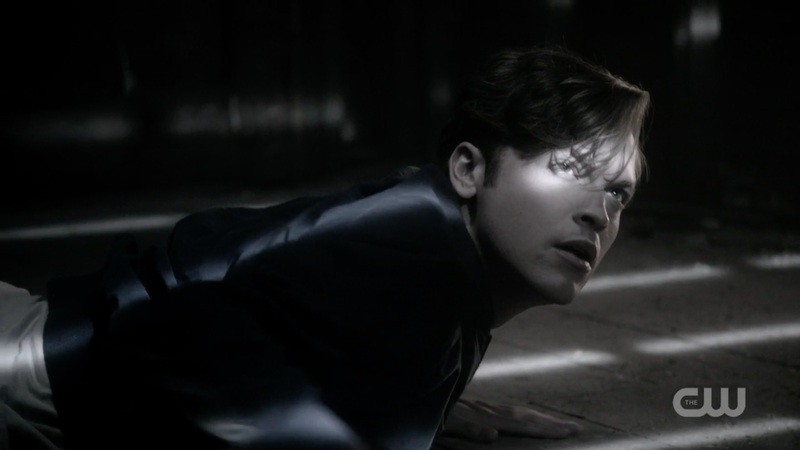 And I wanted the show to acknowledge that, that this was Dean in a terrible place, making terrible choices. Heroes aren’t and shouldn’t be perfect; they can make mistakes. But one of the things that makes a hero is being able to acknowledge their mistakes, to try to do better. The Winchesters have (often if not always) been able to do this in the course of the show, and if Dean was going to do something this unheroic, I really wanted to see him deal with it, for him to realize (or be made to realize) what line he’d crossed. It’s weird, I also had that ‘is Dean possessed?’ thought. Until he shouted at Kaia and then I knew it was him. I think that for that moment in time, with his state of mind, and one thing you forgot to mention is that he KNOWS how it feels to lose his mom, he’s lost her once and now he has the chance to save himself from losing her again, that Dean was definitely not out of character in that scene. Great write up, as usual. For me, when Dean did what he did, it kind of reminded me of when he grabbed Grampa Winchester. In that episode, it was it save Sam. I remember them talking in the car. Dean saying “Sorry”, and Gramps saying “No you’re not!”. At least he didn’t knock her out! It was shocking; but I think it was meant to be. One of the things I love the most about this show , is that they don’t do what you expect. Predictable shows are so BORING! Most of the time, I never see what’s coming on Supernatural. It’s GREAT!! That’s what keeps me on the edge of my seat each week. Why we are all holding our breath until Jan 18th. As far as dinosaurs go, WHY NOT? We don’t know really yet; but since we are in alternate worlds here, I say anything goes! Every time I read your articles and understand that we are in many respects similar in opinion. I was impressed by Dean in this episode. It does not look like he was at the beginning of season 13. His opinion and mood are too changeable. But maybe it should be so. Lynn you should show Dean Winchester some respect and also he was right to think that jack was bad and I still don’t get why everyone is loving him that much like jack is still boring. The actor was not impressive. Liked that Kaia punched jack. But hope she would forgive dean cause he is the best hunter and hero. Dean calling patience was not a bad thing! It wasn’t stalking it’s called asking a pyschic for help and he being a dumbass for not answering his calls. I mean it wouldn’t hurt to anwsner deans calls. So you were wrong for saying that Lynn. Anyway I loved the dinosaur print way more awesome than the whole spin off thing. I better see more dean and Sam in that world and less wayward crap next year. Ps dean is still a damn hero and he’s awesome. Patience was a dumbass for not answering deans calls. Plus she is a rip-off from that’s so raven. She is boring too. Like I said Dean Winchester is the best and I don’t care for your reviews Lynn it’s lack luster.